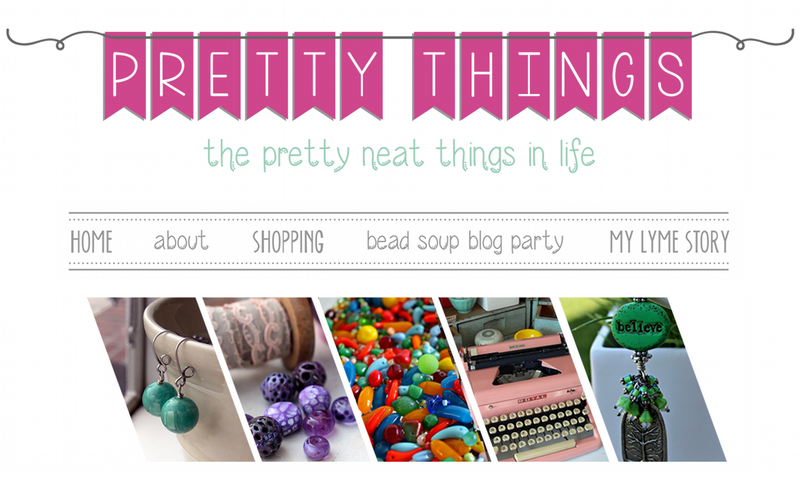 Pretty Things: Win a Bead a Day Calendar! Lovely. I'll play. I don't twitter or facebook and I'm taking some time from my blog so this comment will have to do! Thanks for your comment about Rocky at my place. I'll take all the hugs we can get. i'll play and I facebook! Lori, love your stuff! Congrats on this one! My son loves his calendar I gave him from a few years ago. Is this your second time in the Bead a Day calendar? Hi Cindy! Yes, this is the second time I've done this calendar -- I'm going to have to take a break from next year, though, because I'm tutorial-ed out! They take a lot of work! I didn't know they made a bead calendar! How fun! Your necklace is beautiful! Thanks about your comment about Twedle... nope not strange at all about long legs... or elongated legs..esp in black and white tights LOL! Wow I love your beads, and jewelry! Of course I'd like to win the bead calendar! 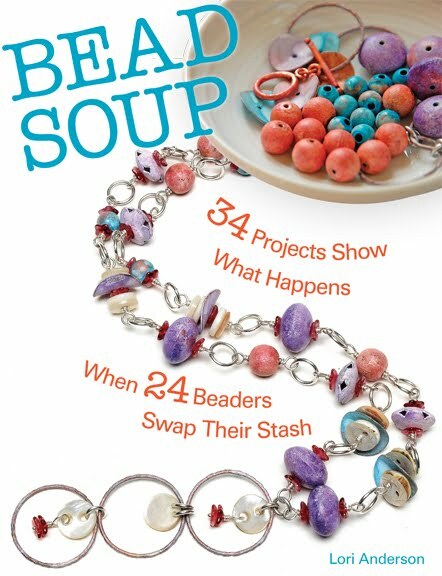 lovely necklace...and how exciting to be published in the bead a day calendar...congrats! How fabulous!! Thank you for the chance to win!! That necklace is just extraordinary! What a gorgeous necklace and this calendar looks so great! Sign me up for sure! :) I can't access facebook right now or my blog, but if I do, I will be sure to come back here and leave links. Congrats on making it into the calendar! I've spent my entire life making all sorts of things, but recently discovered jewelry making....it's the MOST fun! I'd love to win all those hot tips...please enter me too. Congrats on your lovely necklace feature. That looks like a great calendar! Congratulations Lori!! I wonder when I win (thinking on the positive side - hee hee) if I could actually learn how to bead?! Hey!! That is so cool that you are in the Calendar! It looks like it is by the same company that did the Sewing Calendar that I have some projects in. Oh, I hope it's me. I don't Twitter or Facebook, either, and I don't have a blog. I think I'm becoming something of a Luddite. LOL! Anyway, I'd love to win; hope mine is the lucky entry. And congratulations on all the beautiful jewelry you create. I've loved seeing it over the years. Great give away Lori! I did a tweet on twitter and I wil post about it as well on my blog yeah 3 points for me. Have a great day and thanks for stopping by. I haven't tried beading but I would like to. It's easy to see why they included your necklace in the calendar. It is absolutely lovely. That necklace is so pretty! I'm new to beading...I'd love to create something like that. This looks like a interesting calendar.Please count me in. I didn't know that they have a Bead a Day Calendar.Very cool. Your work is awesome !!! I am just starting jewelry making and I love it.Thanks for the giveaway. 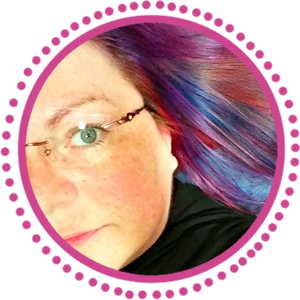 Gosh, I love your jewelry and your site. I'm glad I found it. Sorry, but I don't twitter, but I love your calendar. Ooohlala!! What a gorgeous necklace! 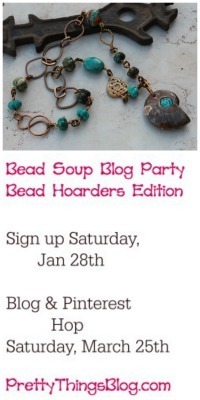 Bead a Day Calendar is a great idea! Thank you for the contest! The calendar is a great idea and congrats to you! Your necklace is gorgeous too. Thank you! Love the necklace and that looks like a great calendar. What a cool calendar. I had no idea that such a thing existed. I would love to have one for new ideas. I might have to order myself one online since I haven't seen them in stores (although it might be too early for the 2010 calendars in stores right now...). How unusual and fun. Thanks for the giveaway! how fun - great way to learn! oooh, I had one of these calendars a few years ago; really liked it, but wasn't as impressed with the calendar the next year. last year - there were no calendars to be had in my area. Hope all the designs are as lovely as your necklace. Sweet necklace. My children and I recently started beading. It's fun and relaxing. Thanks! I put it on facebook. Sounds like a wonderful calendar..
How perfect is this? I have never seen a calendar like this for beading. I love it! My teen daughter loves jewelry making. I'd love to win this for her. 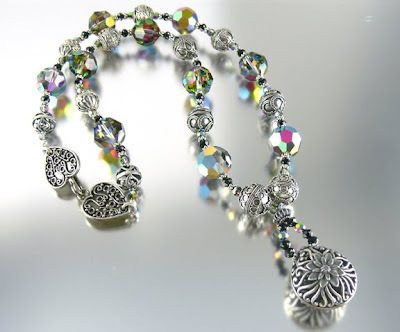 Christina - xristya@rock.com - Lovely bead calendar and necklace! I love the calendar and would love to win. My email is under the header. Click "contact. Thanks you so very much for this give-away!!! Congratulations, I wrote in the post about this give-away ::here::. It was great blogging about the give-away. What a fun thing to win this would be!! Thanks for the chance. I have been trying my hand at beading. This would help me alot. Oawow, my mom could spend weeks with that. :) Lovely, thanks for the chance! What a neat calendar! I would love something like this! Ahhh, I would LOVE to win this as a gift for my Mom, an amazing beader. I love to bead! Thanks! What a lovley giveaway! My sister is into beading and this would be a lovely gift for her. I'm in. How fun to look forward to a new bead each day. Hubby and I are both big beaders, thanks for the chance to win your calendar! How nice! I'm a long time beader. Any inspiration is a good thing. I love to bead but never seem to make the time to do it! This calendar would be wonderful at reminding me to take some time to do the things I enjoy! Thanks for a great giveaway! This is not only a calendar. but something to cherrish forever. I've blogged about the give-away and I, and my two girls, would love to enter the give-away. My mail is at my site. To be found through "contact" under the header. Thanks a lot for such a lovely give-away!! Twittered about the give-away at three accounts: Laanetweets, ActionAutism and actieautisme. Have a wonderful time drawing the winner!! I love beading but haven't done much of it lately. Maybe the Bead a Day Calendar would give me some inspiration and I would find the time to make a couple of beautiful pieces. Thanks. My mom is a bead queen. I would give this to her, because now that she lives alone, she needs something to keep her busy. She would probably do every single project. Love your necklace. I would also love to have the calendar, just what I need to keep me on track. Thanks so much. this looks like fun! I've just gotten into beading so an idea a day would be helpful for inspiration. This is such a neat giveaway! I would love to win! 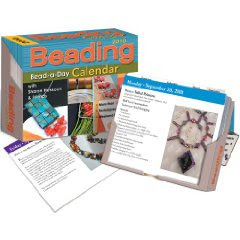 I love the idea of a beading calendar. I do beading for gifts. I barely go on Twitter anymore. Shame I didn't see this till today, otherwise I would have blogged about it. Great giveaway! This would be my startup...kick start.